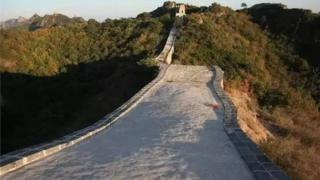 Chinese officials have come under fire after repairs to the Great Wall left part of the ancient structure smoothed and resembling a concrete path. A five-mile (8km) stretch of the Unesco world heritage site was repaired to protect it from exposure to the elements. The ancient stone wall was repaired with materials reported to include sand and concrete. "It really was an ugly repair job," a local official admitted. Ding Hui, the head of the Liaoning Provincial Antiquities Bureau, said the repairs to the 635-year-old structure took place in 2014. He said the repairs filled broken gaps, and added an additional protective layer on the top surface "like a hat", but admitted "the surface does not look ideal". The repairs have only now come to light from photos posted to Chinese social media platform Weibo, where thousands of users criticised the renovation work. However, an official survey said the stretch of wall was in danger of falling apart and being washed away by the rain. The affected section of the Great Wall lies in Suizhong county, along the border with Hebei province. Local news outlets reported a wide variety of materials had been used, including sand, lime and cement. The work was labelled "basic and crude" by Dong Yaohui, vice-chairman of the Great Wall Studies Society. The Chinese government has specific regulations on the preservation of the Great Wall, which is crumbling in many remote locations. Some stretches have been damaged or demolished over the years. The law for damaging a cultural relic is strict, with those found guilty facing up to 10 years in prison. The Great Wall, a Unesco world heritage site since 1987, was built and rebuilt on a continual basis from around 220 BC until the Ming Dynasty in the 1600s, when it was the world's largest military structure. Designed to protect the Chinese empire from northern invasions, it once stretched 20,000km (12,400 miles). Several museum employees in Egypt endure a hairy time after the beard on the burial mask of the pharaoh, Tutankhamun, comes unstuck and is rather too hastily glued back on. The authorities are not amused. Media captionCecilia Gimenez: "Everybody who came into the church could see I was painting"
An elderly parishioner carries out an alarming restoration of a prized Jesus Christ fresco in a church near Zaragoza in Spain. Bizarrely, the monkey-like do-over has brought in tens of thousands of admiring pilgrims since its creation in 2012, helping to ease the town's recession. It's a miracle. Not so botched, perhaps. Although some criticised the repair of Spain's 9th Century Matrera Castle, saying it had been turned into a 1960s multi-storey car park, the architect had the last laugh as he walked off with the architecture and preservation prize at the Architizer A+ awards. Then there are these embarrassing miscalculations through the ages, from Sweden's Vasa warship to London's Millennium Bridge.